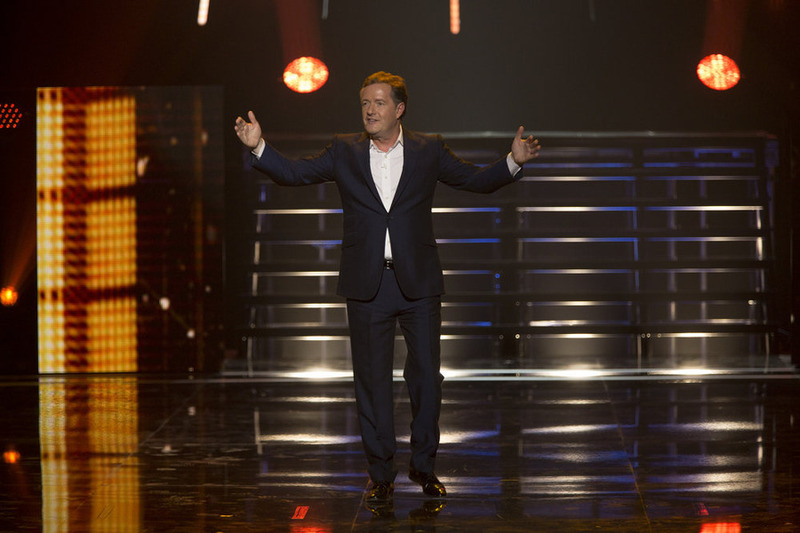 One of the original judges from “America’s Got Talent” (AGT), Piers Morgan is returning as a guest judge in the final episode of Judge Cuts where the judges will decide seven more acts out of 20 to continue to the live shows. Piers was a judge in the first six seasons of AGT. During a press conference call, Piers Morgan and AGT Executive Producer Jason Raff were interviewed about past experiences along with Piers’ upcoming episode. Piers was asked what types of contestants excite him the most? He replied that anything that’s different. Piers explained that there are “so many derivative acts who are all trying to copy from previous seasons.” He said when he used his Golden Buzzer this season, it was on an act that was “so an amazingly fresh, and non-derivative act.” One he said he could see head-lining in Las Vegas, touring the world, representing America and could see it making tons of money. Raff said it was a rush giving Piers the ultimate power of the Golden Buzzer where none of the other judges could stop him or have any control over him. Piers said don’t copy other people. “Think about what you are and what you want to be. The most successful entertainers are just being themselves.” He said they get so many copy-cat acts. Find a talent that is unique. What is a day in the life of a judge like? Piers said he worked from day one with Jason Raff who runs the show from behind the scenes. Making the show is incredibly hard work. There are hundreds of people traveling around America to try to produce the best possible show. They go through hundreds of auditions to make maybe one audition show. He said he’d work 12-15 hour days. As they say to acts themselves, “there’s no substitute for hard work.” They are out to create those “magical, theatrical moments” in the show. 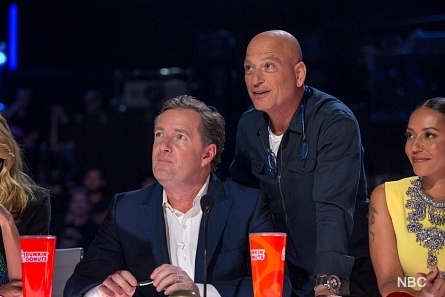 Pictured (l-r): Piers Morgan, Howie Mandel, Mel B.
Raff said they taped the Judge Cuts episodes not in the order that they air. The actual first Judge Cuts show is the one that will air last which is Piers Morgan’s episode. It was an 18.5 hour day. Raff said “thank God it was Piers because no other guest judges would have put up with that” and they were trying out a new format. There’s sometimes 20 minutes of down-time between acts. Raff explained about the process of the Judge Cuts that at the end of the middle rounds the judges have to pick who’s moving on to Radio City. “Those discussions can be quite argumentative. Trying to figure out seven out of the 20 acts just performed in front of you can never be captured properly on TV,” he explained. Piers agreed that “it’s personally subjective. One person’s idea of a brilliant act is often very different from another judges. One of the biggest headline acts in Las Vegas is still Terry Fator. You know you have that ability as a judge to do that.” He said he always took that very serious. Self-proclaimed “King of All Media’ shock jock Howard Stern entered the judging panel as Piers Morgan exited. Piers was asked what it was like to work with the guy who replaced him. Piers answered, “that was for me fascinating because I’ve been a massive fan of Howard Stern’s for decades. Whatever he decides to do he’s always fantastic.” Piers admitted that “there is a part of you that hopes your replacement is not as good looking, intelligent, or funny.” But, he always enjoyed watching Howard on the show. Piers was impressed when he worked with Stern for that really long and grueling day. He said Howard was so selfless and fun to work with. It was a pleasure and an honor to work with. He said they had “a big man hug” and it was a mutual enjoyable day, and they had never met before then. Piers found some common ground with Stern. He said he saw a lot of himself in Howard on how Howard judges, and they both find Howie Mandel annoying. Raff said from day one, Piers came onto the set and they really didn’t know Piers. Raff said they were sensitive to having another British judge because Idol had Simon and they were doing so well. Piers convinced the network that he was the right guy. Raff recollected that with Piers and other original judges Brandi, and David Hasselhoff, “it was all very surreal” and thought that they would be lucky to get seven episodes let alone ten years. Piers stated that the biggest star of any of the talent shows around the world is Terry Fator. “He just uped his deal by another 5 year deal. I always felt that winning the show is not necessary.” Piers pointed-out that Jackie Evancho came in second place on AGT and has had great success. Same for Susan Boyle. It’s that exposure that they get on the show that is crucially important and many acts that didn’t even make the finals manage to build great careers out of it. Piers stated that working with past judges Sharon Osbourne and David Hasselhoff was “extremely dangerous and liable to be very flammable at any given moment.” Raff said many things were thrown at Piers by Sharon including bottles of water. Piers said it’s a miracle that Hasselhoff never hit him and that they’ve become good friends since being on the show.